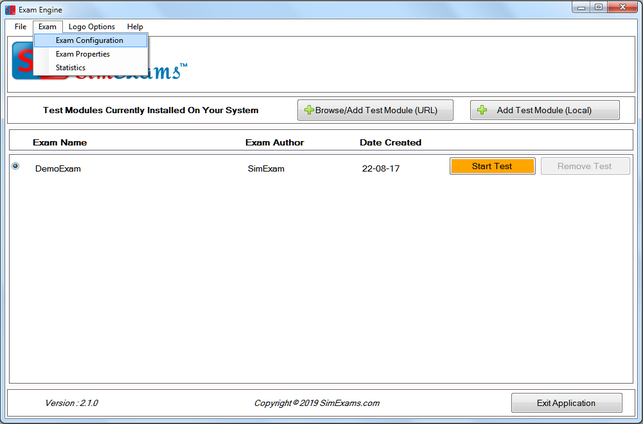 Exam Configuration: To use this feature select "Exam Configuration" under "Exam" menu in main window. This option allows you to configure the Test Module. A new window with exam configuration options will open. Exam Name : This field displays the "Exam Name" which was provided while creating the exam. This field cannot be edited in exam configuration, to edit exam name please use "Edit Exam" option in main menu of author. Number of Exams : This filed is displays the number of different exams that will be made available to the candidate when the author database is used in CBT Software- Exam Engine. This field is automatically updated based on the field "Number of questions per exam". Each exam will have a equal number of questions, a unique question set selected from all the questions present in the database. No. of Questions per exam : By default this field will show total number of questions present in the database. Max score : This field is used to set the maximum score for the exam. Default values is set to 100. 1.3. Allowed Exam Modes : This section allows author to select if the questions in the database will be available to the candidate in learn mode, exam mode or both. Uncheck to disable. Learn mode : Provides interactive learning environment where candidate can go through each question and view flash cards and correct answers for each question. Exam mode : Simulates actual exam environment in which candidate needs to answer exam created by instructor in a given time without any help from flash cards. 1.4. Permitted buttons: This section allows author to select the buttons and features which will be permitted when candidate is taking an exam. Previous : Previous button allows the candidate to view the previous question. Disabling previous button will force the candidate to view the questions in forward sequence only, after once viewing/answering the question candidate will not be able to go back to that question. Bookmarking Allowed : Candidate can bookmark any number of questions while taking the exam and view only bookmarked questions at any time during the exam or after the exam (for retaking). If unchecked bookmarking will not be allowed while taking the exam. Un Answered Questions Only : If selected this option all the question that are currently un answered by the candidate will be displayed. Bookmarked Questions Only : If this option is selected all the questions that are bookmarked in current exam will be displayed. Pause Timer : This feature will allow candidate to pause the exam timer while taking the exam. 2. Show Default : This button will show default values for all the configuration options. 3. Update & Close : This button will save any configuration changes made. 4. Close : This button will discard any configuration changes made.